Imogen's Typewriter. 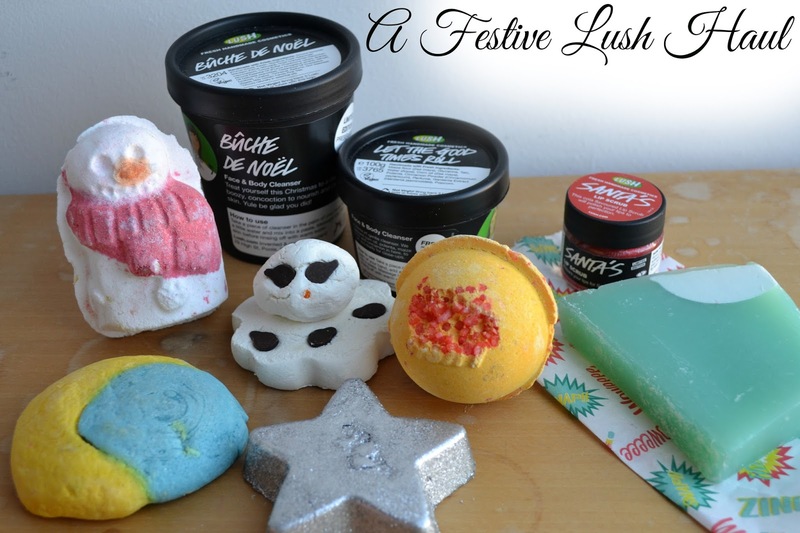 : Blogmas Day 4: A Festive Lush Haul! I have a massive link between Lush and Christmas in my heart, it's just always got me in the spirit, especially after working there last year at Christmas time.. So I have a haul to show you today and if you have anything you want to see a review on, just let me know. So in a little more detail..
Bûche De Noël Cleanser. I love this as we move into December, it's just nice to inject a little Christmas wherever you can and this smells amazing. Like marzipan and fruitcake- it's basically Christmas cake in a cleanser. Let The Good Times Roll Cleanser. If you get one thing from Lush this Christmas, make it this. I spoke about this in detail on my old blog here but in short, a cake scented cleanser that gently exfoliates and leaves your skin deliciously moisturised. Santa's Lip Scrub. This smells exactly like cola, exactly. But the taste is a bit off, either way it's a great little thing to have handy if you have dry lips then need a scrub. I always say I'm sure you could make these pretty easily but seriously- who has the time? Christmas Eve Bubble Bar. I buy one of these every year for my mum to use- you guessed it, on Christmas Eve. It's become a little bit of a tradition now. It smells like Jasmine and is perfect to relax with before the big day. I'll be doing a full review on this later on in Blogmas. Star Light, Star Bright. This was a new product this year and I knew I had to get one. These are very lemon/lime and maybe not a traditional Christmas scent but it's very cheery. And they get silver shimmer just about everywhere, I'll be trying this one tonight! Snow Globe Soap. My hand soap of choice for in the bathroom, I tend to stock up on this as well and it just smells lemony and fresh. Fun Fact: This was the only soap to sell out before Boxing Day at the Lush I worked at last year. Cinders Bath Ballistic. I didn't get any of these last year for some reason and smelling this, I have no idea why. It's a very warm cinnamon and perfect to pop into a hot steamy bath on a cold night. Just smelling this made me feel jolly. Snowman Bath Ballistic. This is Butterball but cuter, it smells like vanilla and cocoa and is just a really smooth gentle scent. They too tend to be a little oily so I'll probably end up splitting this little guy in two. Melting Snowman Bath Melt. How cute! This little guy is definitely one to put on display in the bathroom. I can normally get three baths out of him too. I can't put my finger on the scent but I only really buy him because he's cute and always leaves my skin really smooth. Phew! I think that is me done for a whole month of Christmassy baths. I tend to do a big stock up on Boxing Day as well as everything is usually 50% off but my local Lush has actually shut down (boo!) so I may have to venture online this year. God help me. I also picked up something for a giveaway I'm doing at some point so look out for that! Do you like Lush at Christmas? What is your favourite product? What a fab haul. I can never show restraint in LUSH. I get all giddy. Everything you got looks so cute! I love Lush packaging and the few items I've tried of theirs have largely not disappointed.